Another quick reminder... When you mail your package please send me the DC (tracking number). When I receive your tracking number your name will go to blue in post 1. Thanks everyone and I am looking forward to seeing your creations!! BeckyB yours is done. I just need to get it packaged and addressed. I'll have DH drop it off at the post office next week on his way to work. Found the pattern, found the yarn in my stash and started crocheting. Should be done tonight and ready to mail Monday. Maybe Tuesday if we get the 12 inches of snow the weather guy is predicting. Got the yarn today for your cloth, MockinJay - My 7 year old, Michael & I went into Hobby Lobby so he got to pick it out!! I got the yarn for your dishcloth today too! Can't wait. Will start on it tomorrow after church! Finished up the dishcloth today, cshort. It'll go in the mail this week; what day depends on the weather. Supposed to be 11 tonight, 19 tomorrow, 10 tomorrow night, and finally back above freezing Wed--weather to hibernate and crochet! Jessicali, got your dishclothe done today and will go in the mail this week! I got yours done today as well - and will get it in the mail as soon as I can get to the post office!! Have heard from my partner - Kristy. I have begun your dishcloth and hope you like it. We're having horrible weather here, so even if I get it done today, I won't be able to mail it for a few days. We have had over 10 inches of snow, howling winds blowing the snow everywhere and our HIGH temp for today is predicted to be two below zero. I have your dishcloth finished too. I will be going to the post office one day this week. Stay warm and safe. Michiganirish, your dishcloth is in finished and sitting in the mailbox. I sure hope you like it. 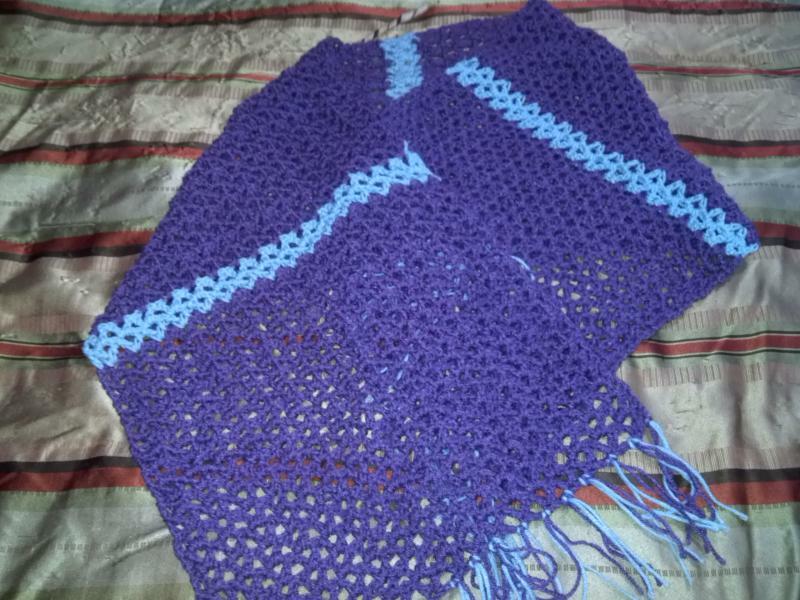 LegalWoman17, I made your's this weekend. Hope to put it in the mail tomorrow. Stay warm up there! Warmer, but foggy and rainy here today. Becky, DH took your package with him to mail today. Hope to have the tracking numbers later. The Dishcloth swap is the only KISS I think I ever do because its one of the only things I've ever seen that I make. I do like the low pressure though. It is quick and fun. BeckyB if the tracking is correct and the weather holds you should have your dishcloth on Thursday. Gonna try to get to the Post Office later today. LOTS more snow and below 10 degrees here right now. I have trouble right now with my camera and I cannot take a pic..hopefully can get it fixed soon as I know you all would LOVE to see this beauty..too much for words.......Thank you so very much. It was pleasure meeting you and learning about you and your family. 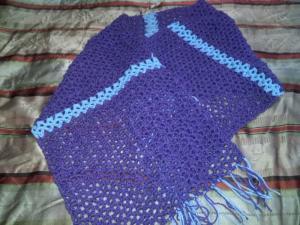 Couldnt go to work today, so I could not mail out your dishcloth today Jessicali. It is 8 degrees right now and the windchill is -3. Suppose to get low neg temps tonight. Stay warm you'll. I know what you mean because it's 2º here with a windchill of -18! Made it to the Post Office. Package mailed....WooHoo I hope it doesn't freeze before making its way to howieann. Just heard that it is -1 and feels like -17. Yikkees! If you happened to see and read my post before this above I was raving about the beautiful dishcloth I received from MissyAnn.....I'll now explain further. Early this morning I put her dishcloth out to be mailed today. She explained mine would be mailed soon...As MissyAnn and I started to get to know each other I had mentioned how hubby is in early stages of chemo/radiation for cancer. (Infact he had his first radiation today.) Anyway, as I got my mail today in the mailbox was this larger package...from MissyAnn...???? 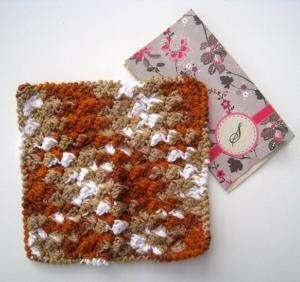 Thank you sahm2g1b for the beautiful autumn colors dishcloth you sent. I love it! DH thinks it will look great in our kitchen but it's too pretty to use, LOL!